VILLA PM is a project designed by Architrend Architecture and is located in Ragusa, Italy. Photography by Moreno Maggi. 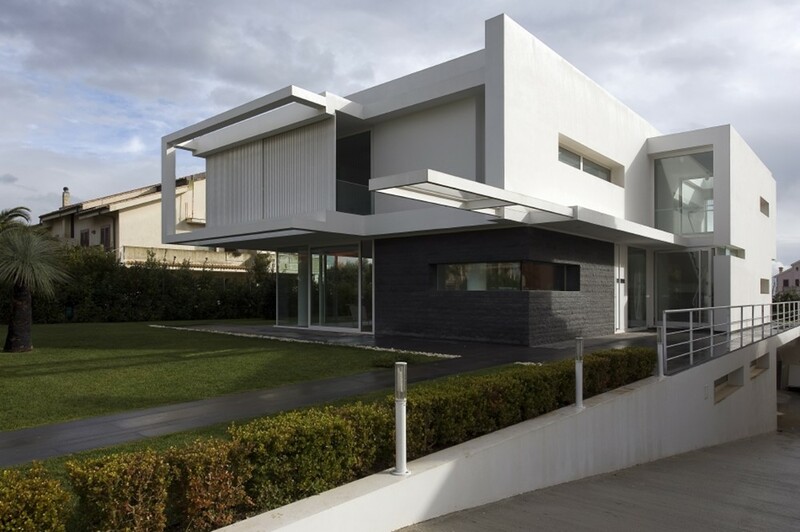 “The villa is located in a suburban area within a residential area. The research project its own identity through the creation of simple volumes and divided between them. The contrast between the large windows and dark surfaces of the ground floor, lava stone, and the white walls of the first floor makes the construction to be suspended and light. At the ground floor windows open onto the garden are opposed to the first floor cantilevered walls consist of sliding panels in vertical profiles of aluminum, which act as a sunscreen, and at the same time clearly characterize the villa. You arrive at the villa by a path paved with lava through the front garden, a steel roof with a dramatic change in the pathway and protects at the same time introduces an element which projects outside the main facade of the building. The angle on the roof of the villa entrance is a wall covered in lava rock cleft and contains a cut corner, a window onto the living room. The opposite edge is instead of glass and turns on the side elevation along the length of your stay with sliding glass doors to the garden that interact with the outside world in absolute transparency. The outdoor area of the garden is designed as a natural extension of living inside, some particular points of view are indicated by the palm rest is a smooth surface with grass. The outer fence is made up of a wall covered with slabs of lava blaze eye of partridge, the coating is continuous and about the gate and pedestrian gate on the driveway, making it completely homogeneous fence line, lifted from the ground through a collection at the base of the wall. more dense, formed by the close of the boards of the jokes that sunscreens dematerialize the volume of the first floor, glazed sbalzante corner of the room, supported by circular columns placed inside to the rear. The functions are distributed in a pattern fluid, the large living room has a central patio glass illuminated from above, with a palm tree in the middle: the green led inside the house. This entry was posted in bathroom, bedroom, house, kitchen, living, pool and tagged Architrend Architecture, bathroom, bedroom, house, house idea, houseidea, kitchen, living, myhouseidea, pool, villa, VILLA PM on November 27, 2017 by admin.